Cucumbers are of various types. There are vining cucumbers and then there are compact bush type cucumber plabnts. 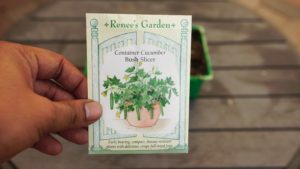 Today we will look at growing a bush type compact cucumber plant in containers. This cucumber is a bush type, compact cucumber variety that be easily grown in containers. This variety of cucumber from Renee’s seeds has a high germination rate and can be easily grown in seed starting cells and then transplanted into containers. ← Welcome To The October California Garden – Gardening Tips, Advice & A Lot More! You made some nice points there. I did a search on the topic and found all individuals will agree with your blog. Your blogs are concise, to-the-point and full of great information about gardening.